Building a space rocket for different altitudes requires different designs, which are related to differences in atmospheric pressure. Despite the improvements over the years in designs, at very high altitudes, no design seems to operate very efficient today. Today's multi-stage rockets require a tremendous amount of power and weight to place a much smaller and lighter object into space, any improvement in efficiency will reduce the cost of the launch or increase the maximum weight we can put in orbit. I think I might have found a new method to build a rocket engine, one that should increase efficiency at high altitudes, with only a small increase of cost for the construction of the engine. The idea comes from the trail of light seen in Kazakhstan on 30th June 2010 and a similar phenomenon seen in Severodvinsk, 20th January 2011 and October 2nd 2015 at Cape Canaveral. First, let us take a look at existing rocket engine designs, and the difference in the way that the engines are designed for low or high altitudes. The image on the left is a photo of a Viking 5C rocket engine which was used for the first stage of the Ariane 4 launch system, which made 113 successful launches. Because the engine is used for the first stage of the rocket the engine was designed for the purpose of use at low altitudes. Below is an extract from the book 'Rocket and Spacecraft Propulsion: Principles, Practice and New Developments' by Martin J. L. Turner. "The Viking engine is intented for first-stage use, and has an expansion ratio of 10, which is typical. The thrust coefficient of 1.57 at sea level is again optimal for the early part of the flight when the atmospheric pressure is still substancial. The engine does not operate at high altitudes, and the vacuum thrust coefficient is far from ideal. One the other hand the vacuum and sea-level specific impuls are not very different, showing that this engine is indeed optimised for low-altitude work." The text makes it clear to us that there is a need for a different engine design at higher altitudes, therefore the second of third stage of the rocket needs to be equiped with a different type of engine, one that is more efficient at higher altitudes. The reasons for the differences in the designs are explained in the text below taken from Wikipedia. The optimal size of a rocket engine nozzle to be used within the atmosphere is achieved when the exit pressure equals ambient (atmospheric) pressure, which decreases with altitude. 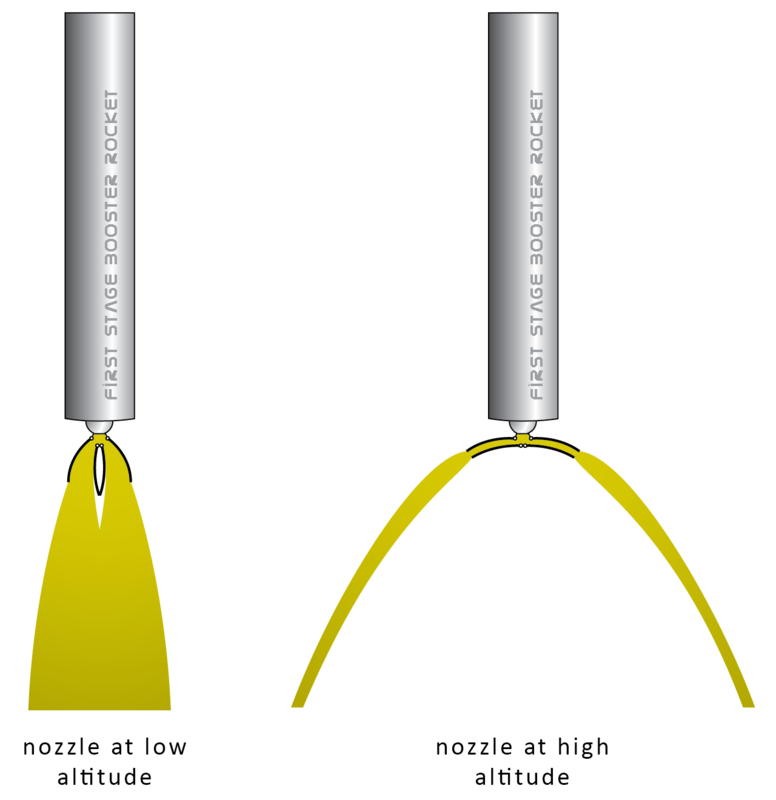 For rockets travelling from the Earth to orbit, a simple nozzle design is only optimal at one altitude, losing efficiency and wasting fuel at other altitudes. Just past the throat, the pressure of the gas is higher than ambient pressure and needs to be lowered between the throat and the nozzle exit by expansion. If the pressure of the jet leaving the nozzle exit is still above ambient pressure, then a nozzle is said to be "underexpanded". If the jet is below ambient pressure, then it is "overexpanded". Slight overexpansion causes a slight reduction in efficiency, but otherwise does little harm. However, if the exit pressure is less than approximately 40% that of ambient, then "flow separation" occurs. This can cause jet instabilities that can cause damage to the nozzle or simply cause control difficulties of the vehicle or the engine. Third stage rocket engine designed for vacuums. In some cases it is desirable for reliability and safety reasons to ignite a rocket engine on the ground that will be used all the way to orbit. For optimal liftoff performance, the pressure of the gases exiting nozzle should be at sea-level pressure. However, if a rocket engine is primarily designed for use at high altitudes and is only providing additional thrust to another "first-stage" engine during liftoff in a multi-stage design, then designers will usually opt for an overexpanded nozzle (at sea-level) design, making it more efficient at higher altitudes, where the ambient pressure is lower. This was the technique employed on the Space shuttle's main engines, which spent most of their powered trajectory in near-vacuum, while the shuttle's two solid rocket boosters provided the majority of the liftoff thrust [Text from Wikipedia]. The text above shows that the differences in altitude are already taken into consideration, and therefore different engines are used for the different altitudes and different atmospheric pressures. However, the solutions found for the rocket designs at higher altitudes are likely not to be the most efficient. This inefficiency is hinted to us when we look at the highest altitudes and the vacuum of space. Below is another quote from Wikipedia. For nozzles that are used in vacuum or at very high altitude, it is impossible to match ambient pressure; rather, nozzles with larger area ratio are usually more efficient. However, a very long nozzle has significant mass, a drawback in and of itself. A length that optimizes overall vehicle performance typically has to be found. Additionally, as the temperature of the gas in the nozzle decreases, some components of the exhaust gases (such as water vapour from the combustion process) may condense or even freeze. This is highly undesirable and needs to be avoided. The idea for the new engine design comes from a visual observation, found in photos and videos of space rocket launches. If you look carefully at photos of rockets that travel at the highest altitudes, then it is possible to see that the trail of the plume that comes out of the rocket expands at higher altitudes. It becomes wider and wider and at the same time it becomes hollow. All the energy extents sideways, despite that the nozzle of the rocket engine is pointing downwards. The reason that this happens is because in the vacuum of space the plume wants to make that wider movement, because of the properties of the medium. The vacuum of space behaves differently than the air that surrounds us here on earth at the low altitudes. A movement in a straight line downwards from the nozzle of the rocket would be an inefficient, an undesirable movement for the low atmospheric environment. Therefore the plume extents itself outwards, despite of what the shape of the nozzle of rocket is. The movement ignores the designed shape of the nozzle, but the shape of the nozzle and the initial movement it want to bring about does result into a major energy loss when the plume is forced to extent outwards by itself. The trick to build a better rocket engine is to build a nozzle for the engine that can expand outwards, and forces the movement of the plume into the correct shape and movement that the low atmospheric environment desires, therefore not losing energy but maximizing efficiency instead. For the low altitudes we can use the same nozzle, which has a mechanism to expand or contract itself therefore it can start off in a contracted state before it is expanded outwards at the higher altitudes. The expansion happens gradually, and is dependent on the altitude and the local atmospheric pressure. As the rocket climbs higher and higher into the sky and towards the upper edge of the atmosphere, the plume becomes wider and wider, while at the same time the area right below the rocket nozzle becomes more and more empty as the shape of the plume becomes hollow. The shape that the plume takes in at these high altitudes is the shape that the low pressure environment wants it to make. It is the most desirable shape for the high temperature motion of fluid that is ejected at great speed from the nozzle (you can click on the image below to enlarge). The loss in efficiency at high altitudes with a conventional rocket nozzle is closely similar to what would be the loss in efficiency if the new nozzle design for high altitudes would be used at low altitudes instead. Any person who sees the new design for the first time thinks that the design is fated to be very inefficient, because we are used to live at low altitudes, and we know and feel how the rules apply here. We humans do not understand sufficiently jet how the rules apply up there, at very high altitudes. At high altitudes it is the nozzle design that we find uncommon that is most effective, at low altitudes it is only what we are already familiar with what is most effective. The effect of this design could be that the rocket will be able to climb to higher altitudes and greater speeds with the same amount of fuel. If this new design is sufficiently effective then it could open the way to constructing first stage rockets that do not require a second of third stage to reach orbit. It might be possible to build a one stage rocket, or a better naming might be a one stage spacecraft, which takes off, enters orbit, docks, undocks, re-enters the atmosphere and lands on a runway, all in one piece, without jettisoning any disposable parts. This would greatly reduce the cost of space travel and the time it would need to prepare the spacecraft for a next mission. An example of how the nozzle for the rocket could be constructed is found in a kitchen utensil shown in the image above. The image shows an expandable metal dish that is used to steam vegetables inside a closed cooking pot. This kitchen utensil shows how it is possible to construct an expandable rocket nozzle out of metal. A somewhat similar technique is already used for the construction of jet engines. The video above shows how an expandable nozzle works for a jet engine. The space rocket engine would need a similar solution for the outer walls of the nozzle. The difference with the new space rocket engine design is that there would also need to be a second expandable mechanism for the inner walls. One is to limit the extent of the rocket plume outward, the other is limit the extent of the plume inward. This difference is illustrated in the image below.